Labor Day, celebrated in the United States on the first Monday of September probably has its roots in Canadian labor tradition. On 15 April 1872 the first workingman’s demonstration of significance in North America was held in Toronto Canada for the purpose of freeing 26 members of the Toronto Typographical Union imprisoned for striking for a 9 hour work day. 10,000 workers participated in this demonstration called for by the Toronto Trades Assembly. Unions were allowed in the United Kingdom, but still outlawed in Canada, and there were other demonstrations of solidarity including a mile long parade of union members in Ottawa in September of 1872, the year anti-union laws were repealed. The Toronto Trades Association and its successor, the Toronto Trades and Labor Council, continued to have annual celebrations, and in 1882, invited Peter J. McGuire, a pro union activist and founder of the United Brotherhood of Carpenters to speak. It has been assumed that he proposed the idea of a holiday in support of working men to the Central Labor Union in NYC, but recently this suggestion has been attributed to Matthew Maguire, then the secretary of the CLU. What is definitely known is that the CLU planned the first Labor Day demonstration and picnic in New York City on 5 September 1882. 20,000 workers and their families participated in the festivities in Union Square. By 1885 the new holiday had received municipal recognition in many cities and by 1887 Oregon had given it state approval. By 1894 31 states had recognized the holiday. In 1894 workers in the company town of Pullman, Illinois went on strike. Pullman was a classic company town. Everyone worked for the Pullman Railway Car Company. The town was segregated according to jobs, the workers living in row houses, the managers in modest Victorians and George Pullman lived in the opulent hotel where his business contacts stayed while in town. There were town stores and a town bank. Rents were automatically deducted from paychecks. Pullman was a prosperous company, but a national depression in 1893 had forced them to layoff hundreds of workers and reduce wages for the remaining, yet their living costs remained the same, and were deducted off the tops of their checks. A strike was called and was soon joined by Eugene V. Debs and the American Railway Union. National transportation and mail deliveries were at a standstill, and riots ensued. President Grover Cleveland called out 12,000 troops to quiet the disturbance and declared the strike illegal. Two men were killed by Deputy Marshals in Kensington Illinois before the strike was finally over. Americans were outraged at the president’s response. There were anti Cleveland demonstrations, and congress quickly and unanimously passed and act declaring the first Monday in September to be a holiday for American workers in celebration of their productivity and contributions to society and the economy. This act was on the president’s desk within six days of the strike’s end, and was quickly signed into law. 1894 was an election year, but this gesture to the electorate didn’t help Cleveland win reelection. Currently, less than 15% of the American workforce is unionized. In the mid 1950s almost 50% of American workers were unionized. All Americans who enjoyed a youth filled with school and play rather than work, or who now have a 40 hour, five day work week are enjoying the benefits won by union activists over the last 150 years. Interestingly, while traditional blue collar workers have lost their union representation through loss of skilled industrial jobs in the steel, automotive and other major industries, as well as failure on the part of unions to go after new types of labor as they develop in the economy, and court rulings that have made the American workplace less hospitable to unions, many white collar professions such as doctors and lawyers, having suddenly found themselves as groups of employees of large corporations or governmental bureaucracies, have recognized the organizational and collective bargaining potential of unions, where once these professions were not considered to have the potential to be unionized. 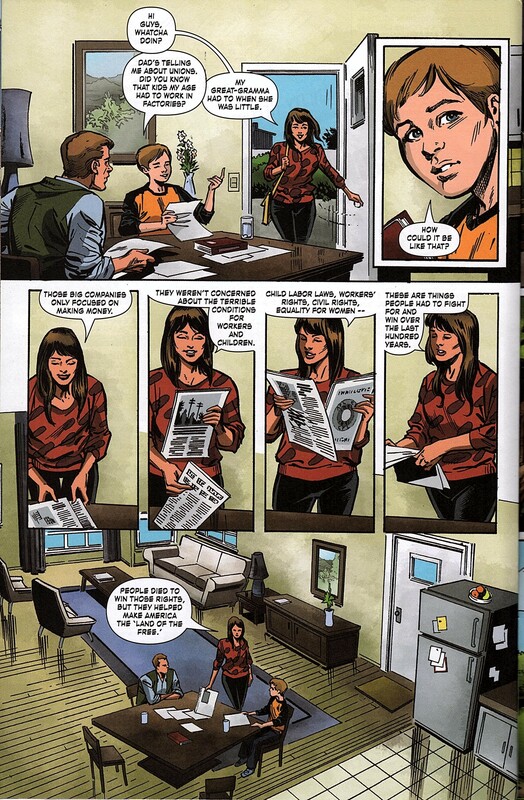 Comicbooks and newspaper strips are products that are produced with a lot of variables; some artists and writers are faster than others, some are more popular, and sell better, providing greater profits. There’s also a lot of piece work and subcontracting. In addition, a publishers production costs can vary. These factors, plus the tradition of comicbook creators as independent freelancers make it unlikely that comicbooks will ever be unionized, yet both writers and artists have a history of union organization in the United States. A strike by members of the Writers Guild of America was expected to halt television production in the Spring of 2001, but was resolved at the last minute, and many younger fans may have forgotten that it was a TV writers’ strike of a decade previous that rearranged American TV schedules from a single season beginning in the Fall and ending in the Spring with a Summer season of reruns, to our new schedule of shorter seasons punctuated by reruns, seasons beginning in the Summer, etc. The Writers Guild of America has roots that go back to 1912 and the Authors Guild, which was organized by writers of articles, books, short stories, etc. The Dramatists Guild was later formed, and the two were joined into The Authors League. In 1921 the Screen Writers Guild was formed. These organizations were mainly self help or fraternal organizations with no real bargaining power. It wasn’t until 1933 that the Screen Writers Guild started to get serious and by 1937 it had become a real union with officers and a supreme court mandate to act as bargaining agent for all motion picture writing. They began bargaining with the studios in 1939, and their first contracts were signed in 1942. During the war years there was a general labor peace, but within the organization there were continued power struggles. Meanwhile, a Radio Writers Guild had been formed and they joined the Author’s League, but in 1950 the Screen Writers Guild organized radio writers, and the Author’s Guild, Dramatists Guild, Radio Writers Guild, Television Writers Guild all became part of the Screen Writers Guild. In 1954 the organization was revised, and is now the Writers Guild of America, East and West, the sole collective bargaining agent for motion pictures, broadcast, cable, interactive and new media. This includes TV animation writers. Most animation artists are represented by Motion Picture Screen Cartoonists Local 839, but there’s a long history of competing attempts to unionize the animation industry. 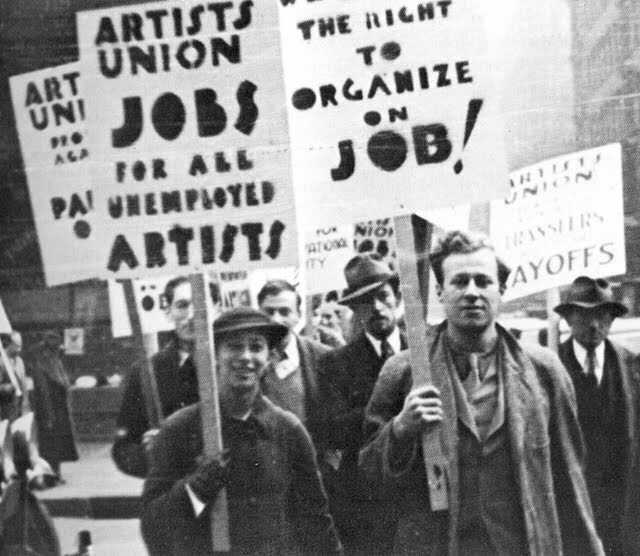 The earliest attempts at union activities in animation studios were unsuccessful, at the Iwerks Studio in 1931, and the Van Beuren Studio in 1935. Fleischer Studios was struck in 1936 by the Commercial Artists and Designers Union. After a five month strike, Paramount, Fleischers’ financial backer and distributor forced them to sign with the Union. The shop was moved to Florida, a strong anti-union state, but Fleischer then had to pay a premium for top animators to move to Florida. The studio went bankrupt, and was taken over by Paramount and moved back to New York. In 1938 the Painters, Decorators & Paperhangers Union chartered Screen Cartoon Guild Local 582. The Guild aligned with the Conference of Studio Unions (CSU), which was in competition with the International Alliance of Theatrical Stage Employees (IATSE). In 1941 they signed contracts with MGM, Lantz, and Screen Gems. Schlesinger tried to lock them out, but gave in after 6 days. Disney, considered the hardest studio to get into was also unionized in 1941 after a dispute about promised profit sharing on Snow White. Disney’s top animator, Art Babbit, who was also president of the in-house union quit his post to join the Guild and was fired immediately. There was a five week strike, and FDR sent in a federal mediator who found in the guilds’ favor on all points. Disney has been a union shop ever since. As before, during the war years there was a general labor peace, but the CSU and the IATSE continued to vie for control of the motion picture industry’s union representation. 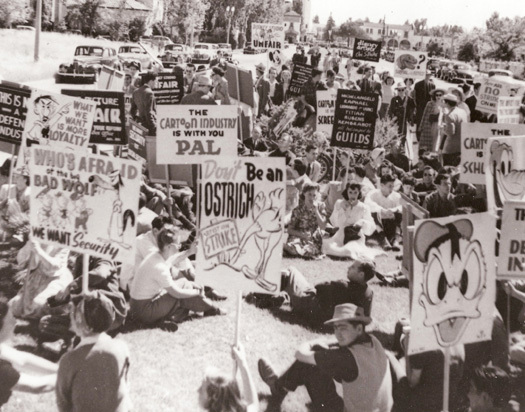 In 1947 Terrytoons was struck for eight months, the longest animation strike in history. Also in 1947 Walt Disney claimed that the Screen Cartoonists Guild was taking orders from Moscow, but at the time the SCG executive Board was staffed by Disney master animators Ken Obrien, Ollie Johnson, Les Clark and Eric Larson. 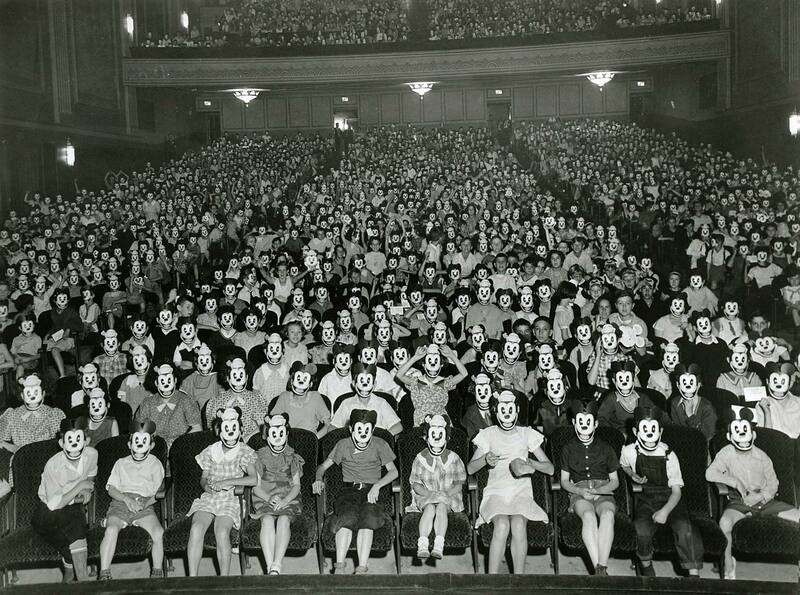 In 1951 Disney and Lantz joined IATSE, and Locals 839 (Los Angeles) and 841 (New York) were formed. The 1950s and 60s were quiet on the labor front. In 1969 there was a drive for residuals for artists and writers, but layoffs in ink and paint were used to split the union. In 1970 ‘runaway production’ or subcontracting out of country effected employment and a strike was needed to guarantee that american animators would be granted full employment before work would be sent out of the country. However, in 1982, the studios regrouped and broke the union in a ten week strike and since then, most ink and paint have been sent overseas. in 1987 Local 839’s membership was at a low of under 800, and Filmation, the last studio to do all finishing work in the country was bought by a Swiss corporation and closed in 1988. However, the animation revival of the late 1980s reversed things. Disney went from 125 animators in 1985 to 1500 in 1995, while Warners, Chuck Jones, MGM, Universal, HBO and Fox opened new animation divisions. Guild membership peaked at about 3000 in 1995, but is down to under 2000, and Disney has recently announced a cut back of 400 jobs by the end of the year. In his History of the Comics, Jim Steranko writes In the early 1940s the American Communist movement made an effort to infiltrate and organize the comic industry into a union, just as they had done with the theatre and film guilds. (Jack)” Cole heard about it, and with the help of artist George Brenner, attended the first meeting and successfully broke it up.” (1) This is the only reference I have for this story, and no other information is available. 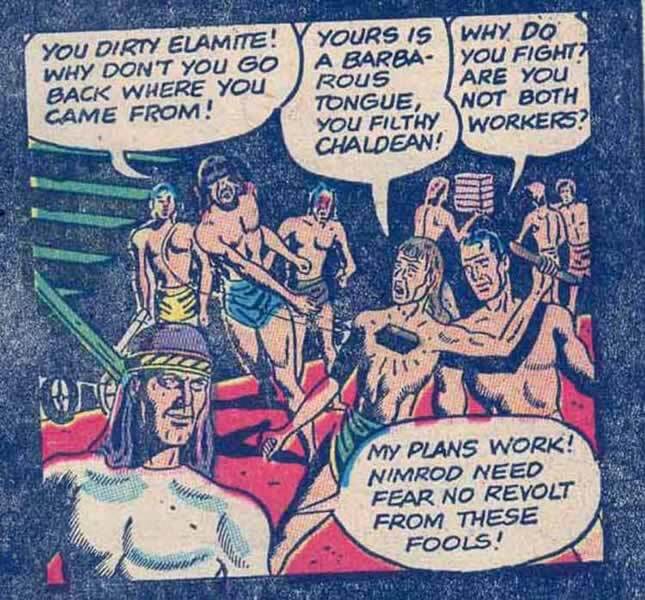 Joe Kubert recalled another attempt to create a comic workers’ union in the late 1940s. He recalled being at the first meeting and believed it may have been instigated by writers who were unhappy with page rates and wanted greater benefits. Josef Rubinstein recalls AC Hollingsworth telling him he found it hard to get comics work due to his union support. Kubert does not recall the above mentioned incident with Jack Cole, nor does he remember his high school buddy AC Hollingsworth at the meeting he attended, so there may have been another organizing effort. The whole problem with the union idea, according to Kubert was that the artists who were getting work didn’t need a union and wouldn’t want to jeopardise their working relationships with editors, and the guys not getting enough work wouldn’t be helped by a union. Apparently Bernie Krigstein was involved with a unionizing effort, but I know nothing about this. While the Disney Studios produced the various newspaper features based on their cartoon characters such as Scamp or Winnie the Pooh, those features were done by members of Motion Pictures Screen Cartoonists Guild #389, and that is probably the only time a newspaper cartoon has been produced under a union contract. 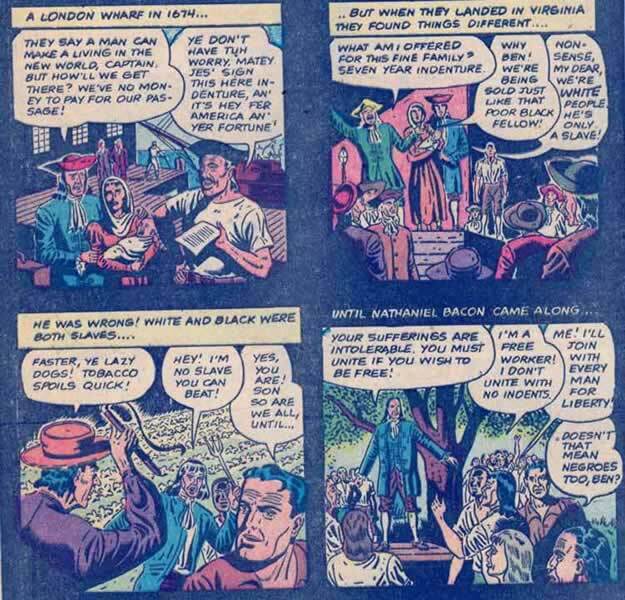 From their inception, newspaper strips, comicbooks and animated cartoons have been connected with the uneducated, delinquent and immigrant classes. Possibly the first regularly published comicbooks of new material were the pornographic 1920s 8 page Tiajuana Bibles. A scan of the New York Times’ index for the turn of the last century shows the same concerns expressed in Seduction of the Innocent half a century later. But from the beginnings of these new media, there have been attempts to use them to educate and propagandize as well as entertain. Comicbooks have been used as premiums for commercial purposes, and used to promote various organizations, social causes and public concerns. They’ve also been used to celebrate inventors and industrialists as well as industries that are skilled-labor intensive and highly unionized, such as the steel or railroad industries. In these books the ideas of social and economic progress are celebrated, but no attention is paid to the workers within these industries or their concerns for job safety or security, or their contributions to the industry. There are some exceptions, however, and they offer some nice material for collectors. Unfortunately, one is unknown to me. Labor is a Partner was published by the Catechetical Guild in 1949. 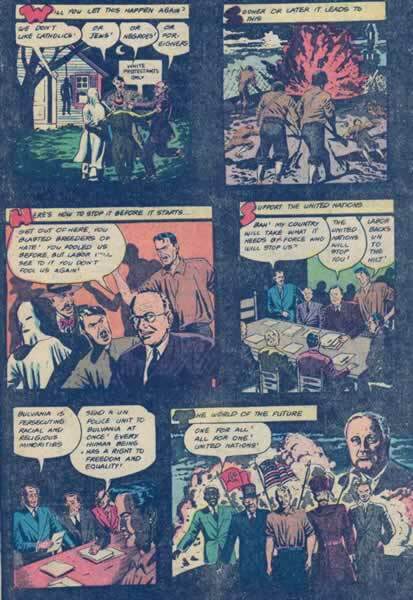 It can be assumed from the title and the content of the better known Guild comic Is This Tomorrow’ that this is a tract encouraging labor to reject communist affiliations. 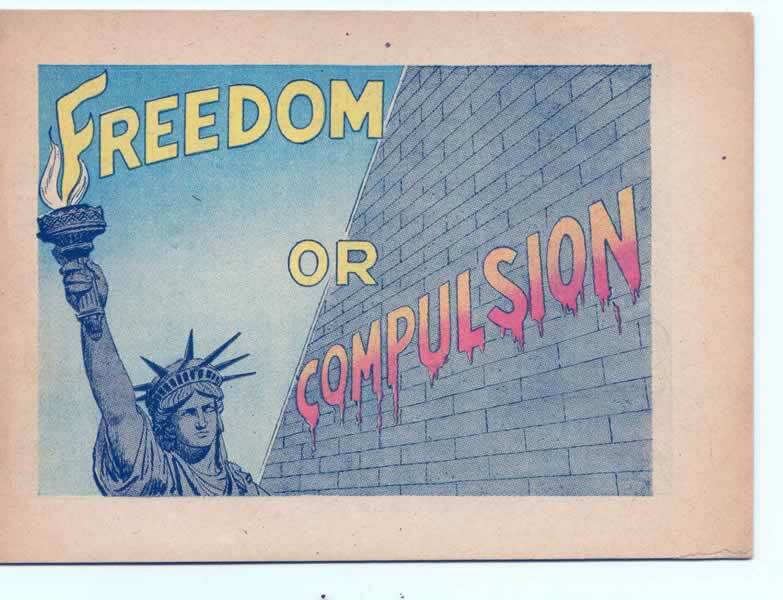 Freedom or Compulsion and Naked Force were published by Commercial Comics, in 1957 and 1958 respectively and were commissioned by right to work groups in Ohio and Kansas. These are 16 page half sized comics that read sideways to the usual dimensions. The scripts are by Malcolm Ater. These are tracts against compulsory union membership, and have similar plots. In the first, a boy gets a black eye defending his dad, who’s called a ‘union buster’ by a neighborhood kid. Pop gives Tommy a history lesson equating compulsory church support in colonial times with compulsory union membership today, and co incidentally, the other boy’s father drops by and condemns his son’s behavior. 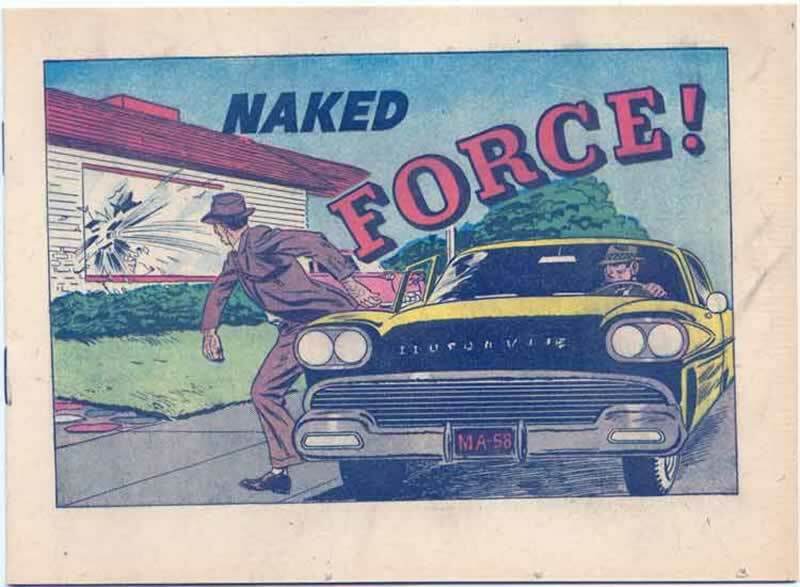 The father is described as a union member who will not go along with unreasonable behavior by union leaders, as is the protagonist of Naked Force, only this time the violence has been escalated from a black eye to a house bombing. In this story, a careless shop steward has started a fire, and when fired from his job, his buddies, the union bosses, call a wildcat strike, and out of state thugs are called in to man the picket lines. George Earner and his pal John Workman try to cross the picket lines, and eventually George’s house is bombed by pro union forces. George and John discuss the situation and their anger at union leaders who are as dictatorial as bosses, and who have let the working man down while living off their earnings. They decide to vote against compulsory union membership in Kansas. These are interesting well produced comics, not in Overstreet, and very collectible because of their subject matter. 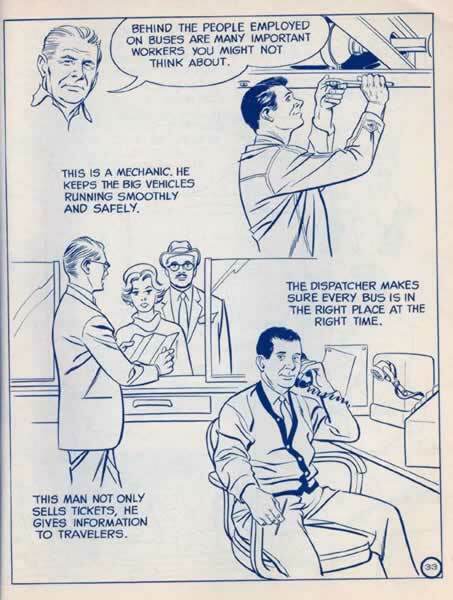 Probably the best known of the pro union comics are the Cliff Merritt books. Two issues of this book were published by the Brotherhood of Railroad Trainmen, and a reprint of the first issue bears the imprint of the National Transportation Union, who published subsequent material. by Al Williamson and Angelo Torres. Do comic books get any prettier than this ? The comics are full sized, running 24 full color pages on glossy paper with heavier covers. Graced with lovely hand colored art by Angelo Torres and Al Williamson, these books are very collectable and have a reputation among ‘good art’ collectors. Cliff Merritt and the Very Candid Candidate finds Cliff trying to get away for a fishing trip, but it seems his nephew, Billy Merritt has been speaking out against union leadership because he believes they’re not acting quickly enough about a member’s grievance. Billy eventually runs for president against Cliff’s best friend. It’s a nice little soap opera story about the conflicts between impatient youth and entrenched power, with a moralistic sub plot about getting caught gossiping. The older men in power come to ask if they’re too complacent, and the young men come to respect their elders’ maturity. 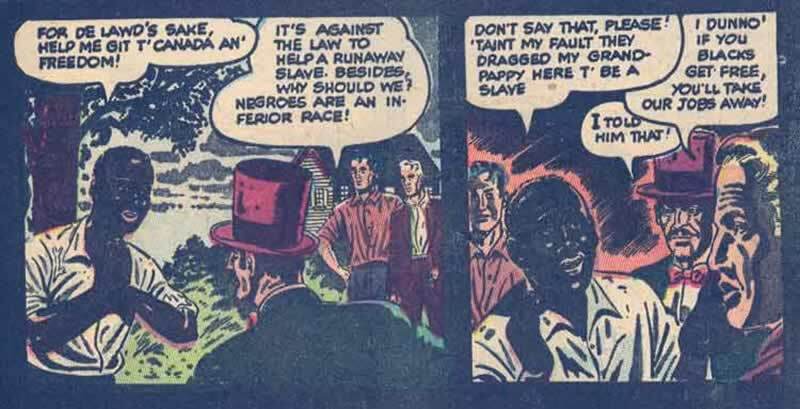 In addition to the comics, there was a coloring book, The Men Who Move the Nation, which has fine, realistic art by Alden McWilliams, and a ‘ politically correct’ reprint with ‘corrections’ by a less skilled artist, turning some of the predominantly white male figures into women and black men. This reprint is retitled People Who Move the Nation. 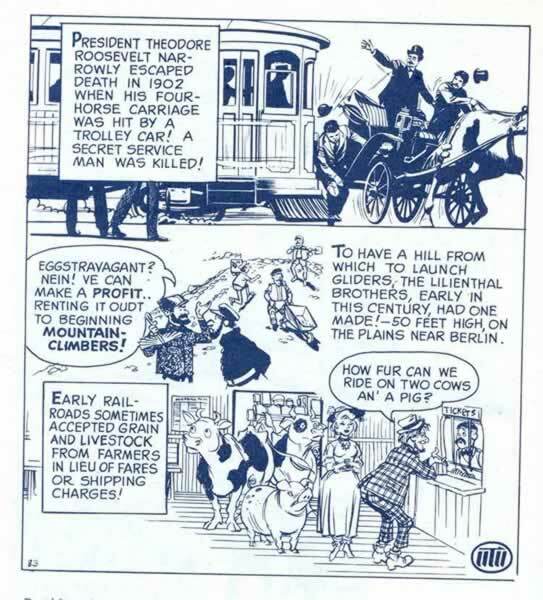 There was also a newspaper strip called Cliff Merritt’s Scrapbook of Men on the Move. This is a single panel with 3 or 4 unframed, unrelated transportation and labor facts, like Believe it or Not. There were at least 135 of these panels produced, and they were distributed through a newspaper distribution syndicate. Part of the material was printed in a digest sized collection called Cliff Merritt’s Scrapbook of People on the Move, published by the union, possibly in 1984. A fuller version, possibly the whole, was published in a regular mass market paperback size by Popular Library in 1973 as Cliff Merritt’s Man on the Move. The art on this is by the late George Evans, and in my opinion is some of his best work. Mr Evans is working in a mixed realistic and light style. He anchors even the cartooniest scenes to reality by using realistic backgrounds, full of perspective and volume, and the work is marked by his usual sophisticated sense of design and use of blacks. The surprise for me is how easily he bends into cartoon, in a couple of places animating animals beautifully. This is brilliant work by a top pro. All the art in the Cliff Merritt series is at the top of industry standards, and they are highly collectable for that reason. George Evans told me that Alex Kotsky was art director for the series, and that explains the quality. Unfortunately, no records exist at the union or at their newspaper distributor about print runs or dates on these books. 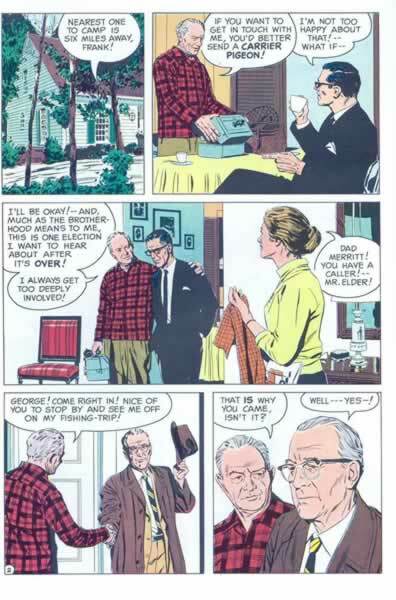 The look of the comicbooks seems to be mid to late 1960s, and the newspaper strip was published in a collected form by 1973. 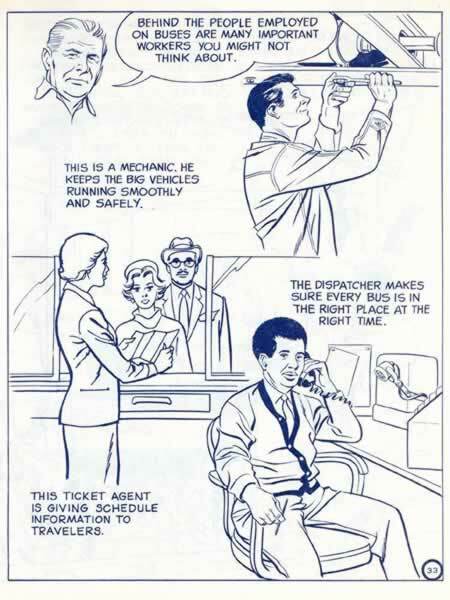 The revised coloring book probably dates from the 1980s or early 1990s. While the Cliff Merritt books are definitely pro union, they are also public relations pieces for the union. They describe a world where the unions work with the railroads for the public good, and everybody reaps the benefits of greater productivity and improved service, but they only imply what is at the heart of any union organization: the interests of ownership and labor are not the same. Joe Worker and this History of Labor addresses class struggle directly. 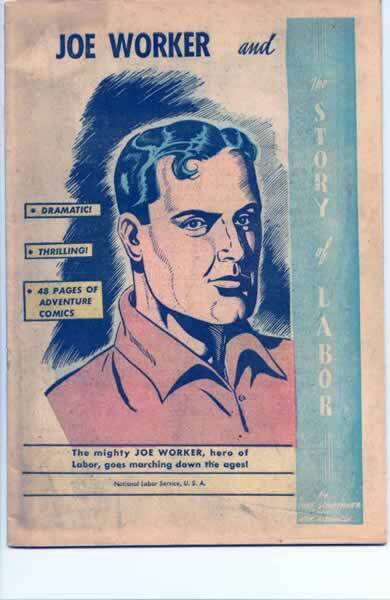 Joe Worker is an eternal heroic worker figure who we first see in ancient Babylon in a revisionist telling of the Tower of Babel story. The scene shifts to American colonial times, and we progress through American history with Joe as he describes economic conditions through time which motivated immigration, revolution with England and the Civil War and shows how organization and unity of the working class brought about positive social and economic changes. He shows the union movement of the late nineteenth and early twentieth centuries to be a continuation of this struggle for equality and freedom. We continue through to the war years where we’re shown that it was unity that won the war. 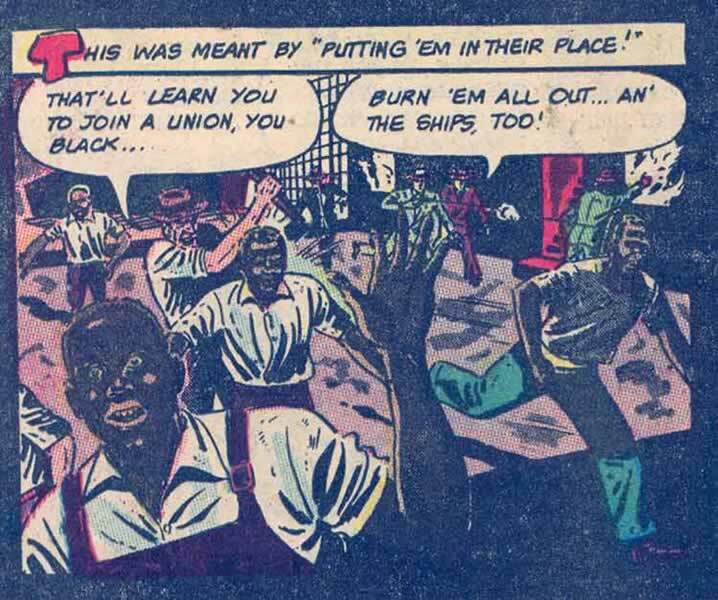 Racial intolerance has been described through the whole of the book as being a tool of the ruling class to keep workers separated, and the book closes in support of the civil rights movement, depicting that struggle as another logical step towards equality and freedom and stressing that racial integration should be a goal of all union members. This is a remarkable book. It is three times the size of most commercial jobs. The story is well written and complicated, heavy on fact and history and it makes its propagandistic points well. 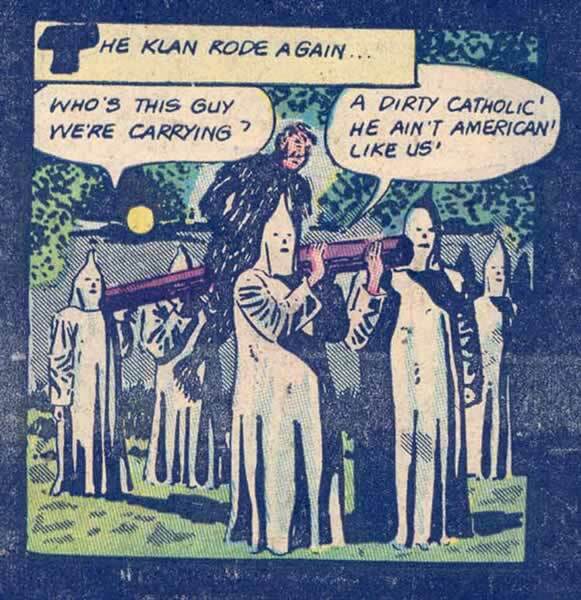 There are several KKK sequences and scenes of racial and religious lynching. It’s support of civil rights was early, and certainly controversial. From fifty years after it ‘s publication we can look back and see that the post war call for civil rights was indeed, the next step towards freedom that workers would demand, and that foresight shows the body of the Joe Worker text to be both radical and relevant to us today. This is a rare book. It is not listed in Overstreet or Gerber. It was a colaboration between the American Jewish Committee and the AFL-CIO in 1948. Both the AFL-CIO and the AJC produced other interesting comics during this time. 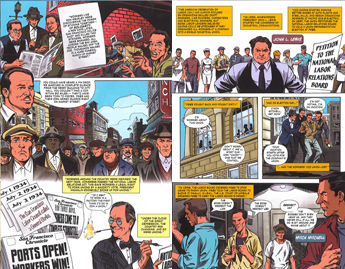 Joe Worker and the Story of Labor is a full sized full color comic weighing in at a healthy 48 pages with paper covers. The story is by Nat Schacnner, and the art by Jack Alderman. Nat Schacnner (1895 – 1955) was an American writer who began his career in science fiction pulps. His first known sale was a colaboration with Arthur Zagat in the Summer 1930 Wonder Stories Quarterly. His science fiction output declined after 1941 and he devoted his time to non-genre historical novels and biographic works, of which his two volumes of Thomas Jefferson’s biography are the best known. Jack Alderman was a Canadian artist who did work for more than 15 companies in the 1940s. His work is simple and forceful in a typical golden age style (2). Joe Worker is a book that should find an audience among collectors of anti communist material such as If The Devil Could Talk or the Treasure Chest series. Its size, professionalism and subject matter make it an important addition to this group, and it may be the hardest one to find. In addition to the Joe Worker comic book, a comic strip was also done. One hundred and sixty panels were produced. 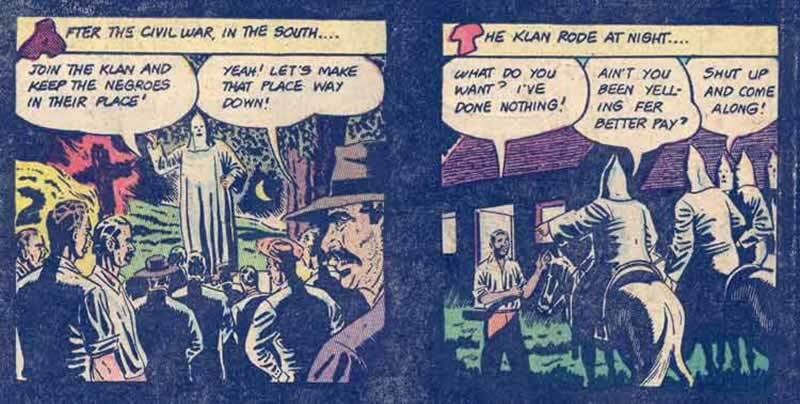 The early strips were by Schacnner and Alderman, continued by the young David Berg, with Sheldon Moldoff taking over the art at the end. 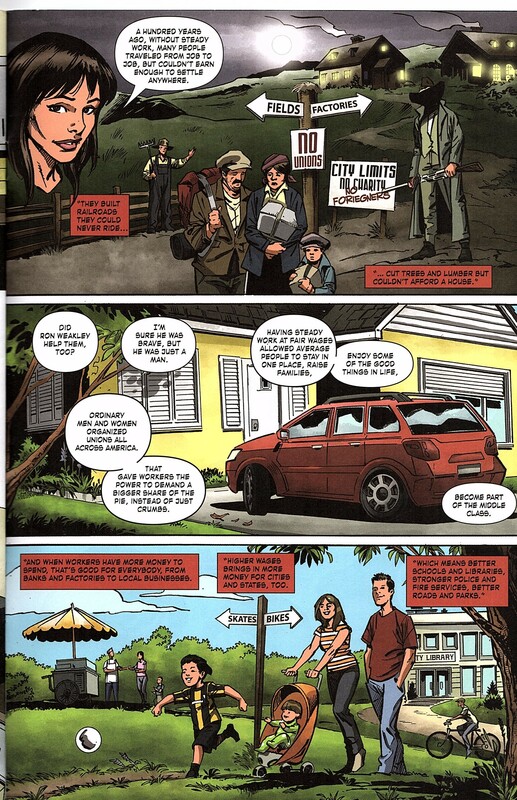 In 2013 the International Brotherhood of Electrical Workers 1245 released the comic book First Day as part of their training program. 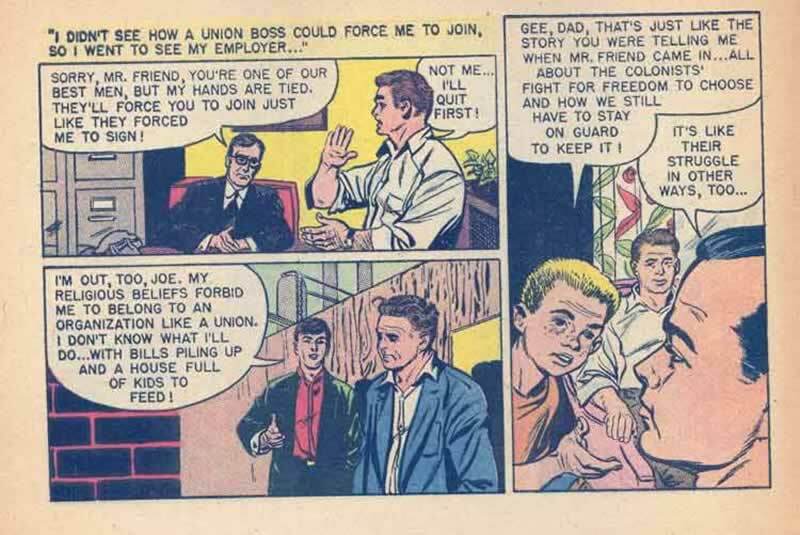 First Day tells the story of the union’s founding by a coalition of AFL and CIO organizers (back in the day when those were separate unions). Written by Eric Wolfe and Tom Christopher, from an original union history by Wolfe, this book is probably the first since Joe Worker to address class struggle directly, showing labor riots and addressing politics and economics from a self consciously working-class perspective. The book was penciled by Diego Barreto and inked by Josef Rubinstein. It won a best of non-regular publications at the 2013 International Labor Communications Association Convention. With the abolition of monopoly capitalism, company towns and child labor it may be easy to forget that unions addressed a variety of legitimate social and economic ills and that all workers have benefited from the struggles of an earlier day. America was founded with a radical sense of liberty and personal freedom. Our rights of free speech, free assembly and free press guarantee our right to organize. It’s been a cultural truism since Ben Franklin stated in revolutionary times that ‘ we must hang together or we will hang separately’, and yes, it’s nice to end the Summer with a three day weekend. All Copyrights 2004, revisions 2014.